Looking for a place to relieve stress while studying for finals? 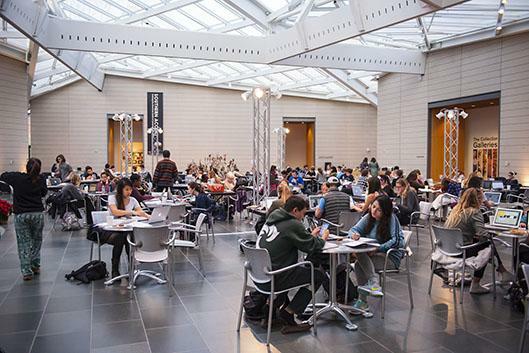 The Nasher Museum will be open Monday, April 30, from 3 to 11 p.m., exclusively for Duke students! Come enjoy warm cookies, fresh fruit, coffee, hot chocolate, hourly art tours, guided yoga breaks from Duke Recreation instructors(bring your own mat), and a variety of sandwiches, salads, and desserts from the Nasher cafe all on food points! Bring your study materials and come stop by! This year we are excited to collaborate with the Duke Wellness Center. We will be hosting essential oil making from 3 PM - 5 PM during Study Hall. Need to get started earlier? For the first time ever, stop by the Ruby for a pre-Nasher Study Hall event (11 a.m. - 2:45 p.m.). The Ruby Lounge and a seminar room will be open for study with free coffee and pastries, and Duke Rec will offer a yoga class (mats included) in a dance studio. Take a break in the CoLab makers pace with some stress-relief coloring activities, too!